↑ Hubbard, Ben; Gladstone, Rick; Landler, Mark (16 October 2018). "Trump Jumps to the Defense of Saudi Arabia in Khashoggi Case". The New York Times (in อังกฤษ). สืบค้นเมื่อ 17 October 2018. 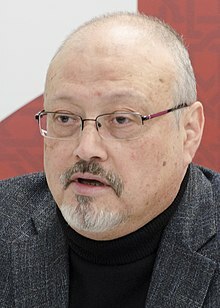 Mr. Khashoggi, who wrote columns for The Washington Post, lived in the United States, and his 60th birthday was on Saturday [October 13]. ↑ "Khashoggi 'died after fight' – Saudis". BBC. 19 October 2018. สืบค้นเมื่อ 19 October 2018. ↑ "What we know (and don't) about missing Saudi journalist Jamal Khashoggi". สืบค้นเมื่อ 16 October 2018. ↑ "Jamal Khashoggi: An unauthorized Turkey source says journalist was murdered in Saudi consulate". BBC News. 7 October 2018. ↑ "Speakers". International Public Relations Association – Gulf Chapter (IPRA-GC). 2012. Archived from the original on 11 May 2012. สืบค้นเมื่อ 10 May 2012. หน้านี้แก้ไขล่าสุดเมื่อวันที่ 1 กุมภาพันธ์ 2562 เวลา 01:06 น.